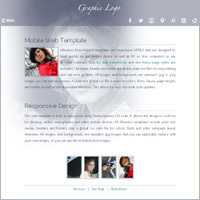 What are mobi-Hybrid® Web Templates? 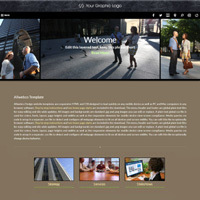 All Allwebco web templates are stand alone HTML / CSS designs. Our mobi-Hybrid® sites are basically standard responsive web design (RWD) web templates that include a few extra *tweaks* to make them extra mobile friendly, while still maintaining full responsiveness for desktop, laptop and tablet devices. 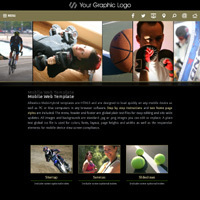 The webpage layouts use Media Queries CSS code, as is used in all RWD websites, and flex to fit the specific viewing screen resolution no matter what the user's computer or device type is. 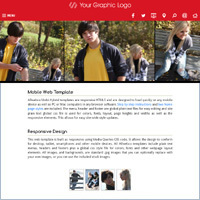 Because they are web standards responsive web design, mobi-Hybrid® templates are good for any type of web development. They're also an excellent choice if you want to target smartphone users more than desktop. For example, when you're selling mobile products, or your website is presenting a menu for a restaurant. They are full featured websites that, depending on the model you choose, include slideshow "sets" or a gallery section, integrated video, shopping carts, pre-formatted pages like about, news, services, site map, PDF downloads, contact, plus a selection of other formatted pages, built-in features & dynamic effects. All our mobile and responsive web templates pass the Google mobile friendly test and grade anywhere from 97/100 to 100/100 (top rating) at Google Pagespeed Insights for user experience. These are the industry standard website checkers used to gauge website mobile compliance and speed. If you currently have a non-responsive or other type of website that is not mobile compliant and is not passing the Google Mobile Friendly Test, you can keep your current site setup for desktop, laptop and tablet, and add a mobi-Hybrid® website template as a mobile version sub-website (usually to be located in a folder named "mobile") and improve your mobile SEO. Any of our mobile web templates (listed above) or the mobile version addon (listed below) can be used as a mobile sub-website located inside a folder in your hosting FTP area. In one sentence: Because it would compromise the template usability. Google Pagespeed Insights checks a number of items on a webpage all related to loading speed. The goal is to have the highest user experience rating possible without compromising the website functionality. Some of the checks are for tap target size and whether the files are minified. To *minify* files (html, css and Javscript) means to remove all the spaces and tabs in the text. If we were to minify the template files, they would then be almost impossible for users to edit with their text, and in the css file edit the font sizes and colors. Minifying the website files is best done after they are uploaded to the hosting server and can be done automatically using different types of server scripts (check in your hosting control panel for this service or you can use a 3rd party script). Tap Targets: These refer to just about anything on a webpage that's clickable, buttons, links, etc. Pagespeed Insights may flag a text link or small button during the checking. Since our templates will usually include some text links on the webpages, the score from GPI may be lowered. But what does this all mean? Ah, here's the bottom line. How fast a page loads has little affect on how well your site will rank in search engines. You can check this out yourself by searching at Google for products related to yours. In most cases one of the top four or five results will be some big bloaty website that loads like a pig, and if you view the source code you'll see tons of code, just in the head section alone, in these websites. Having a fast loading website is desirable for a number of reasons, but it's not the only way, or even the best way to get high rankings in Google. Another consideration is that mobile ranking is not set on a scale. If your site is more mobile compliant than your competitors, it will not improve your position. If that were the case websites with one paragraph of titanic sized text and no images would always be the top listing. Balance: Webmasters should try to build a website that has a balance between load speed, functionality, content / product relevant page copy and images, and mobile and desktop viewability. It is important to have your website graded as "Mobile Friendly" in the Google Mobile Friendly Test. After that, page content and backlinks are needed to give your website a good ranking. See SEO support for more help.